Twin corn tortillas filled with Southwest Roasted Pork, Caramelized Onions, Roasted Red Peppers and mixed cheeses; topped with Taos Green Chili and served with Spanish Rice, Black beans and sour cream. One’s a Corn tortilla “rolled & filled” with Southwest Pulled Pork, Jack ‘n Cheddar Cheeses, Caramelized Onions, Roasted Red Peppers and topped with Taos Green Chili ‘n Cotija Cheese; and the other is our Pepe’s Chicken Enchilada with Pepper Jack Cheese & Cilantro topped with our Del Norte Chile sauce. Served with Spanish Rice, Black Beans and sour cream. 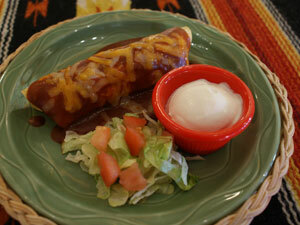 Your choice of any two of Sam’s Enchilada offerings… Shredded Beef, Pulled Chicken or Cheese ‘n Onion. Served with Spanish Rice, Refried Beans and Sour Cream. Triple Treat. 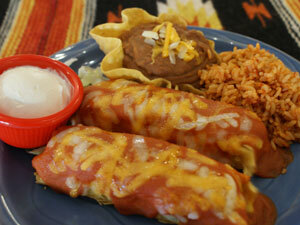 A Shredded Beef, a Pulled Chicken, and a Cheese ‘n Onion Enchilada served with Spanish Rice and Sour Cream.